Property investors have much to be excited about with recently announced plans to develop Jurong. We take a look at the upcoming Jurong Innovation District, as well as Woodlands Regional Centre, and give you the Guru View. Recently announced plans for the Jurong Innovation District (JID) is welcome news for residents of Singapore’s Western region. Between Jurong’s upcoming high tech industries and Woodlands’ Regional Centre, the Western and Northern parts of Singapore, often derided for being inaccessible and far from the city centre, will receive an influx of infrastructure that is likely to drive up property prices. Jurong West, which borders Tuas, is often perceived as a far-flung location. It is after all, located on one end of the MRT line, and is the entry point for the heavy industrial and manufacturing areas like Tuas and Jurong Island. However, after the SMRT extended the East-West line from Boon Lay to Pioneer and Joo Koon as part of the Boon Lay Extension project, transportation links have improved. Residents are able to gain easier access to trains, and it has eased some of the overcrowding at Boon Lay MRT station as well. In Budget 2016, Finance Minister Heng Swee Keat announced the development of the JID, a mixed-use district that is going to be the “next generation industrial estate,” and include R&D and prototyping labs, advanced robotics, and maker spaces. The district will be integrated with the existing campus of Nanyang Technological University (NTU). The state has also planned for further infrastructure development around the Tengah area, with plans to construct civic spaces, green areas, wide pedestrian walkways, and service the area with retail and dining zones. While these developments were only just announced, they are likely, in the short term, to boost property prices in Jurong West, which have been affected by the cooling measures. Although the fruition of these plans are years in the future, it is likely that developers and property sellers will start to raise prices, or “future-price” their homes, based on the potential of the area. Since property curbs were implemented, HDB transaction volumes have fallen to a low of 263 units in Q1 of 2014 (refer to Figure 1). This was a far cry from the 784 units transacted in Q2 2013. Since then, volumes have recovered somewhat, with Q4 2015 closing at 391 units. Four-room flats seem to be the preferred HDB type for the area. HDB prices in Jurong West saw declines as well, with overall median prices falling from about $432 per sq ft in Q2 2013, to a low of $370 per sq ft in Q2 2015. However, 2015 closed on a slightly better note, at an overall median of about $376 per sq ft for the final quarter of the year. Islandwide, HDB resale prices for Q4 2015 ended on a cautious note of optimism, with HDB’s resale price index seeing a moderate quarter-on-quarter increase to 134.8 from Q3 2015’s 134.6. The non-landed private property market in Jurong West has seen renewed interest of late. After the implementation of the cooling measures, sale transactions were tepid, and fell below 50 units a quarter in 2014. However, with the release of new land sites, and the rejuvenation of the nearby Jurong Lake District, the site of the upcoming high speed rail terminus, transactions began to pick up in the area on the back of new launches. These developments include Evia Real Estate’s Lake Life and MCL Land’s Lakeville. The most recent new launch in the area is Koh Brothers’ Westwood Residences. Supported by these new launches, non-landed private residential sales shot up to a high of 325 transactions in Q2 2015 (refer to Figure 2). Median prices at the time stood at $866 per sq ft. Since then however, median prices have moved up to $1162 per sq ft, even as transactions have fallen. The next new project launch for the year is likely to be MCL Land’s Lake Grande, located close to Lakeside MRT station. Word on the street is that the developer is likely to launch it in mid-2016. There are currently no plots of land that are currently up for tender in the area, even on the Reserve List. The HDB also has not announced plans for Build-To-Order (BTO) launches in the Jurong West area for the rest of 2016. It is likely that as plans for the JID mature further, state authorities will release more land into the pipeline for residential and mixed-use development. 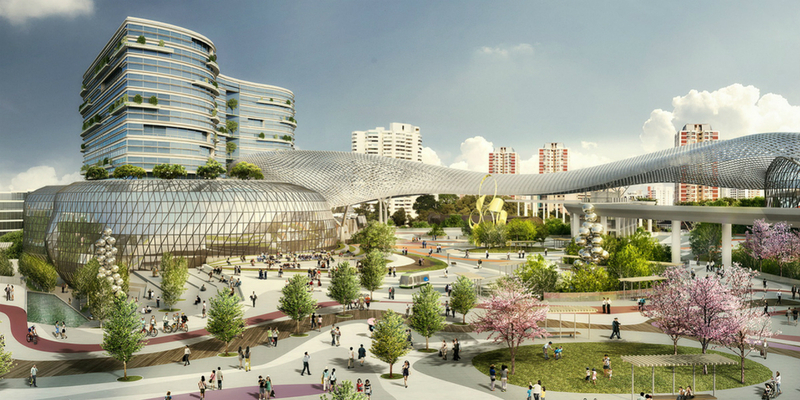 While the JID will bring a lot of excitement to Singapore’s Western end, the North is also seeing a great deal of development with the Woodlands Regional Centre. Plans for Woodlands are a couple of years further along than Jurong’s. The Thomson-East Coast line, set to connect the North with Singapore’s East Coast, runs through Woodlands and terminates at Woodlands North. From there, plans are in place for the MRT to run all the way up north, and terminate in Johor Bahru, at a yet to be confirmed location. Already, commuters can take the Tebrau Shuttle train service from Woodlands to JB Sentral. Such transportation links will only help to increase the flow of labour between Singapore and Malaysia, and provide people with more options, such as being able to live in lower cost Johor, and working in the new businesses and industrial areas around the Woodlands Regional Centre. Woodlands Regional Centre is also part of the state’s plan to decentralise the Central Business District (CBD), with a mix of offices and business parks set to rise in the area. The government even imagines community farms in an upcoming People’s Plaza in Woodlands as well, a civic space where greenery and community thinking can thrive. All these developments are massively exciting for the real estate market surrounding Woodlands. Market response for residential property however, has continued to be lacklustre. Following the drop in transaction volumes post cooling measures, a total of 1,220 HDB resale flats changed hands in Woodlands in 2014. By the close of 2015, the number remained rather stable at 1,227 (refer to Figure 3). Median prices continued to see slight declines year-on-year, from $351.9 per sq ft in Q4 2014, to $345.8 per sq ft in Q4 2015. Condos and ECs in Woodlands have fared only a little better after more aggressive developer activity. The number of transactions rose from 380 in 2014, to 503 in 2015 (refer to Figure 4). This increase was likely due to intensive marketing activities by Bellewoods developer Qingjian Realty, which drove a spike in transactions in Q3 2015. Interestingly, transaction prices in Woodlands seem quite flat, with an increase in condominium prices seen in Q2 and Q3 of 2015, driven by transactions at Parc Rosewood. This is likely due to sellers who fell under the previous Seller’s Stamp Duty scheme, who were cashing out of their units after holding for the third year. Subsequently, private condominium transactions resumed their equilibrium at around $850 per sq ft.
Due to a lower supply of private condominiums in Woodlands and a higher number of ECs, the price differential between the two property classes is smaller than what we saw in Jurong West. Like Jurong West, Woodlands does not have a lot of upcoming developments. The only upcoming development in the area is in Woodlands Avenue 12, an EC site that awarded to MCC Land. That development is likely to be launched between mid- to end- of 2016. As of now, there are no residential land plots in Woodlands up for tender. Like Jurong West, there are also no plans for any BTO launches in Woodlands for the rest of the year. However, the government has released, on the Reserve List, a commercial plot of land intended for offices in the Woodlands Square area. As it is on the Reserve List, developers will need to indicate their interest and a potential bid for the land plot, before the state will release it for public tender. The developments in Jurong West and Woodlands will take some years before they see fruition. It is likely that the government will work to create a catchment of industry, commerce and retail in these two key growth areas, before releasing more plots of land for residential development. While many of the developments in Jurong West are controlled by the Singapore government, Woodlands is in a dicier situation, as developments there are contingent on cross-border cooperation with the Malaysian government. While there have been many public assurances and demonstration of political will that the MRT connection between Singapore and Johor Bahru will happen, the timeline is less clear. Those looking to capitalize on these long term plans, for either rental yield or capital appreciation, will need to have flexible plans to accommodate any changes in timeline. Between these two locations however, it might be better to concentrate on Woodlands for long term capital appreciation, rather than rental yield. The MRT connection between Johor Bahru and Woodlands will create more convenient access between the two areas and it would not be too far out to think that many people might choose to rent across the Causeway and commute into Singapore. Unless things change drastically, Singaporean landlords will find it difficult to compete with Malaysian landlords who can offer lower rents and larger living spaces. Furthermore, the overall lower cost of living across the Causeway might tempt some tenants into Johor, even if rents were similarly priced. However, this is contingent on the two governments finding a seamless, hassle-free way for commuters to cross back and forth. For both locations, investors will need to take a long term view of between 10 to 15 years, if they wish to capitalise on these growth stories.